Join your fellow semi-pro sunbathers along the pristine stretch of superfine white sand. Once the kids scatter a few miscellaneous games and toys around, it'll feel just like the real deal (only with stunning views over the water). You'll be there and back before your crew even realizes you were gone. Convincing your kids to come out of the lazy river will be hard, so you might as well join them. 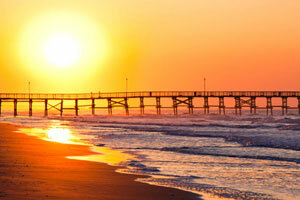 Located right on beautiful North Myrtle Beach. This resort features both an indoor and outdoor lazy river. Relax with a drink and a snack at the poolside bar. Bay Watch Resort & Conference Center by Oceana Resorts is located in North Myrtle Beach, near the area’s best attractions. Don’t bother unpacking once you get to your condo, just get changed into swimsuits, slap on some sunscreen and get ready to hit the pools. You have eighteen different options to choose from: 2 indoor pools, 3 outdoor pools, 4 children's pools and 7 hot tubs (not to mention the ocean!). That’s not all, folks! There’s also an indoor lazy river and an outdoor lazy river. Fans of all things swimming will feel like the proverbial kid in the candy shop. It’s hard to know which direction to head first – a stop at the poolside bar is a definite must. After even the most competitive one in your group has lost count of lazy river loops, it may be time to head back to your spacious vacation condo for lunch. Hit the on-site convenience store on the way for extra chips – they have a way of magically disappearing. Later, after a lazy afternoon poolside, declare yourself off-duty for dinner. There is both a bistro and bar & grill on-site. One- to three-bedroom condos sleep six to ten guests. Full kitchens have everything that you need to whip up anything from sandwiches to multi-course meals. When it comes to in-suite entertainment, the resort has you covered. Flatscreen TVs with premium channels and DVD players have you covered. Catch a sitcom rerun or pop some popcorn and have a family movie night. Bring favorite movies from home or take advantage of the free DVD rentals available for resort guests. Good news! Bay Watch Resort & Conference Center by Oceana Resorts is a dog friendly resort (during October-March only), so there’s no need to worry about getting a dog sitter. The last thing you want to do when you get home from vacation is laundry. Thankfully there is a laundry facility on-site, so that’s one less thing to do when your vacation is over. Once you’re ready to venture off-resort, book a tee time nearby. Golf is a Myrtle Beach must, and the resort is only a 10 min drive to the Whispering Pines Golf Club. Reward yourself for a trip well planned with a visit to Awakening Spa, located at sister resort Anderson Ocean Club, for a body treatment, facial or massage. The SkyWheel is almost two-hundred feet tall and provides the best views of Myrtle Beach. Ride in ultimate comfort thanks to the climate controlled gondolas. Fans of Robert Ripley and his “believe it or not” cartoons will get a kick out of Ripley’s Odditorium. It features Robert Ripley’s collection of bizarre and unusual artifacts. Broadway at the Beach features several attractions that everyone in the family will love. Dinosaurs The Exhibition has life-size animatronic dinosaurs. Kids will have a blast at "Ride a Dino" featuring Triceratops and T-Rex. Visit Ripley’s Aquarium where you can come face-to-face with sharks, eel and sea turtles at the Dangerous Reef or sleep with the sharks. HOUSEKEEPING Limited Housekeeping Services (Trash And Towels Daily). Full-Service Periodic Cleans Along With Trash And Towels Begin For Guests Staying 5+ Nights. Wild Water and Wheels Water Park is open from Memorial Day to Labor Day each year. A pre-authorization will be placed on this card to cover incidentals during the stay. The authorization amount is USD 100.00 per stay. It will be released at check out and will take 3-5 business days for a major credit card and 7-10 days for a debit/check card to show back up on the card.